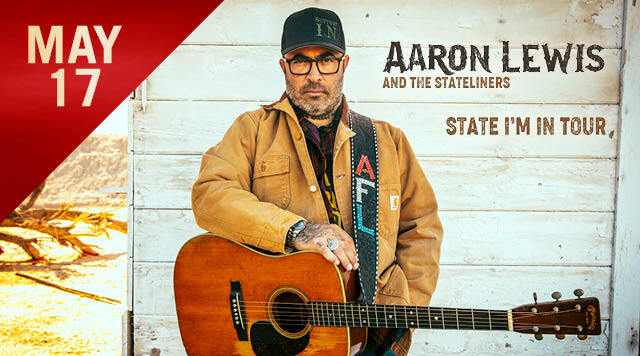 MULVANE, Kan.— Recently wrapping sold-out dates on his SINNER TOUR, Aaron Lewis’ in-demand live show electrifies audiences whenever he takes the stage. Country Rebel raved, "Lewis' voice rings out above all the noise and is even more powerful than ever before…" The self-proclaimed “Northern Redneck” has achieved critical and commercial success with his last album SINNER earning him the No. 1 spot on the Top 200 Albums, Top Country Albums and Top Digital Albums Charts upon release. The 12-track project was voted to numerous Top Albums and Best Of lists and continues to make an impact two years later. Aaron Lewis is known for his outspokenness, outlaw Country tunes and impassioned live show. And today he announced that he will be hitting the road again for THE STATE I’M IN TOUR in advance of new music coming in 2019.